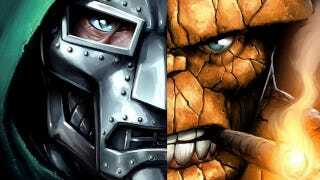 Some new concept art from Fox's 2005 Fantastic Four movie has surfaced, and you're either going to need a bag to vomit in or a handkerchief to wipe the sweat from your brow, because as mediocre as that film was, we clearly dodged a bullet. Unless, of course, you were hoping for a lumpy, rock-tumor-ridden Thing to stalk the screen, or for Dr. Doom to look like a rejected Farscape alien. In which case, uh, sorry about your luck, I guess.